Bai Tu Long National Park in Quang Ninh province was established under the Prime Minister’s Decision No. 85/2001 / QD-TTG of June 1st, 2001. The total area of the National Park is 15,783 ha, of which the sea area is 9,658 ha, the remaining 6,125 ha is the area of floating islands. The buffer zone of the National Park is 16,534 ha, located on 5 communes: Van Yen, Minh Chau, Ha Long, Ban Sen and Quan Lan. Population in the buffer zone is 24,141 people. In the area of Bai Tu Long National Park boundary, there are 109 aquaculture households in aquaculture areas as planned. These are the households that are permitted by the management board to develop their livelihoods and increase incomes. At present, the aquaculture households in Bai Tu Long NP are mainly mollusk (clam) using mainly plastic and styrofoam materials, (used as protection and nursing cages). Recently, some households have used Cement ships for protection work. There are 50 protection rafts in which 35 raft house (area of each cage is 40 m² using about 40-50 Styrofoams with the size of 1m x 80cm and 15 cement ships. There are 100 nursing rafts (each cage uses 10 styrofoams with the size of 60cm x 40cm. Ba Mun island, Minh Chau commune is in the core zone of the NP. 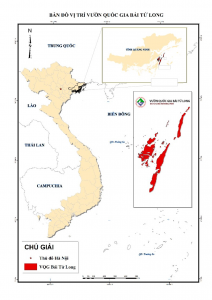 Due to the geographic location, households in the Minh Chau commune mainly catch fish, there are only 03 households cultured, mainly clams, come, oysters. 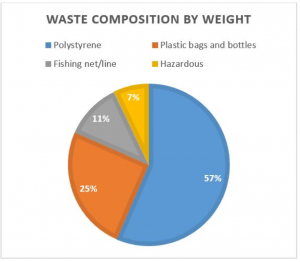 A total number of styrofoams of 3 households are about 330 floats, half of the buoys are 70cm * 50 cm, the other half is 2m * 1m. From 29th, May to 8th, June 2018, GreenHub co-organize with IUCN and partners the program of ‘Artwork from plastic and styrofoam waste- I love sea and island – Born to be wild’. 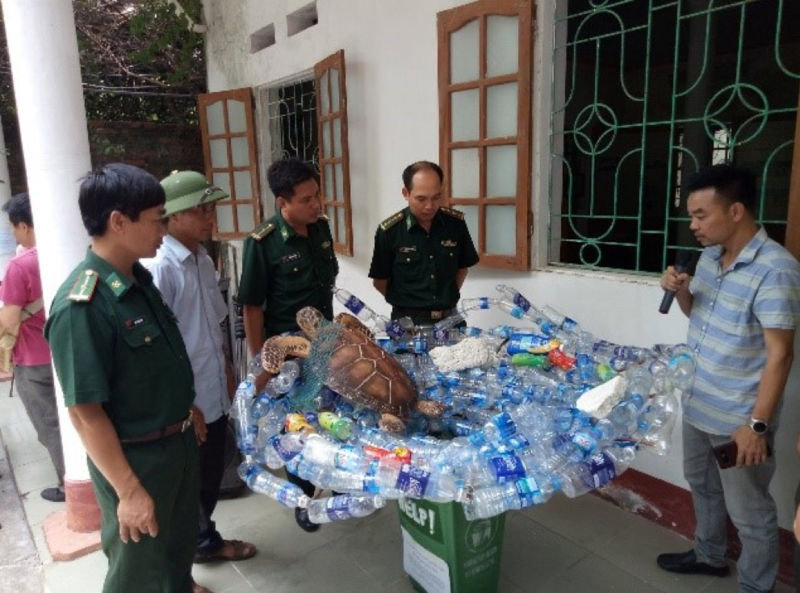 The program is organized in Minh Chau commune, including coastal clean-up, trash sorting training, and art performance. 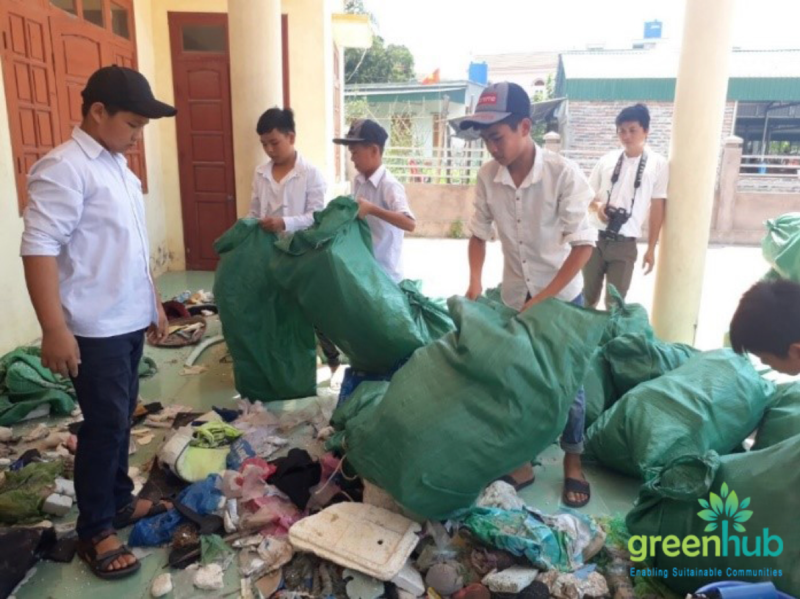 About 100 participants (including pupils in Minh Chau school) have involved in the coastal clean-up in1 hour and collected 141.5 kg of inorganic waste. 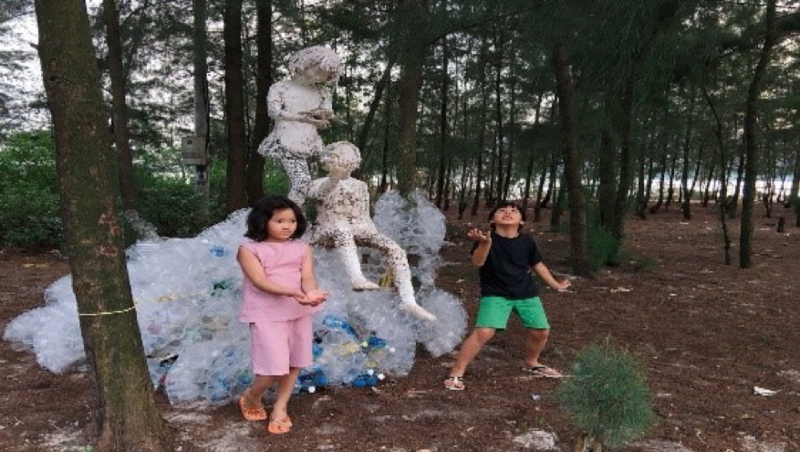 The waste was used to create very meaningful artworks which attracted a lot of tourist and local people to aware of Styrofoam waste and impacts of plastic/polystyrene to marine animals. 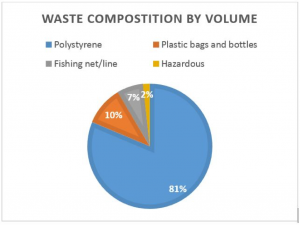 As we can see, although there are decisions to restrict using the Styrofoam in floating aquaculture cages/rafts at both city and province levels, significantly is only 3 aquaculture households are in Minh Chau commune, however, the polystyrene is still more than a half of the total waste (both by volume or by weight). Ba Tu Long NP management board plans to review using Styrofoam in the aquaculture activities and increase the communication program for polystyrene restriction. However, we find that the aquaculture farmers need technical and financial support, guideline and feasibility solutions. GreenHub, IUCN, and our partners continue to accompany with local government and communities in this issue.